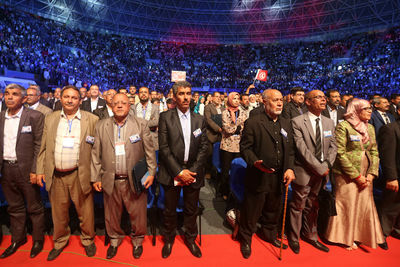 Ennahdha movement held its 10th congress in the olympic covered hall in Rades Tunisia on May 22, 2016. 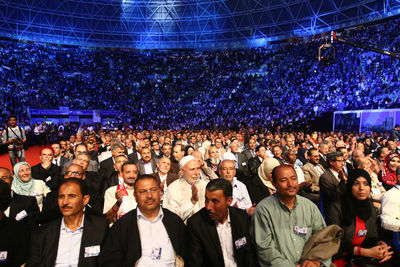 Ennahdha emerged as the largest party in the legislative elections in 2014. 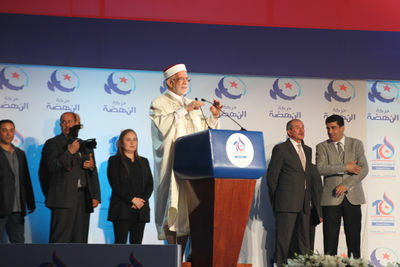 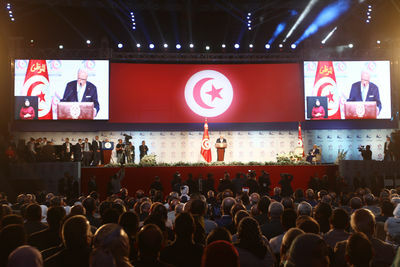 The islamist party Ennahdha won a majority during the elections of the National Assembly regarding the constitution in 2011 and it was the first islamist party to win the election after the revolution of Tunisia in January 14th, 2011. 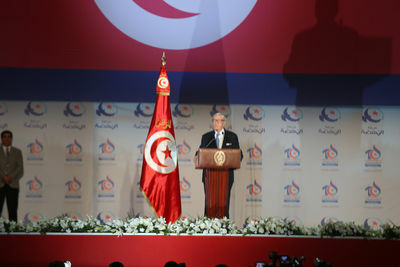 Rached Ghanouchi, president and leader of Ennahdha party, while he delivers his speech at 10th the congress held in Rades on May 20th, 2016. 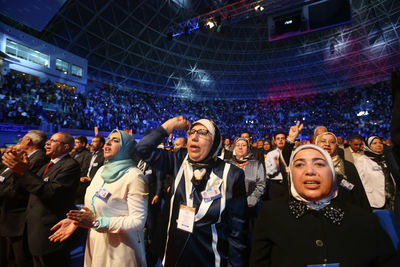 Supporters during the opening session of Ennahdha's 10th congress that was held in Rades on May 20th, 2016. 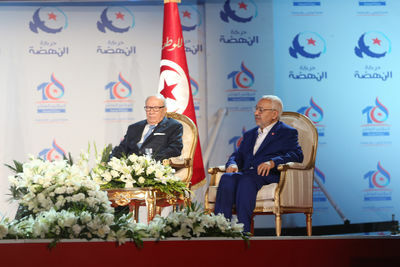 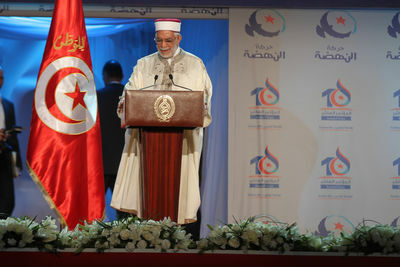 Tunisian president Beji Caied Sebsi speaks as a guest of honor during the opening session of the Ennahdha's 10th congress that was held in Rades on May 20th, 2016. 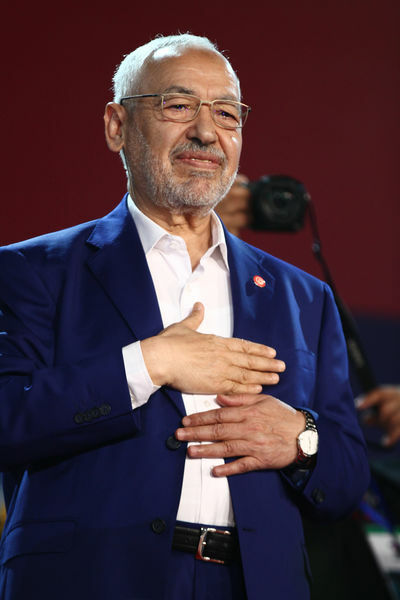 Rached Ghanouchi, president and leader of Ennahdha party, welcomes supporters at 10th the congress held in Rades on May 20th, 2016. 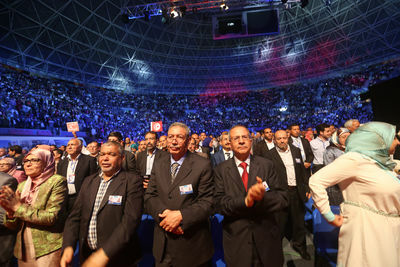 From the left to the right: Abd Elfattah Moumou,vice-president of the Ennahdha party, and Rached Ghanouchi, president and leader of the party, during the political movement's 10th congress that was held in Rades on May 20th, 2016. 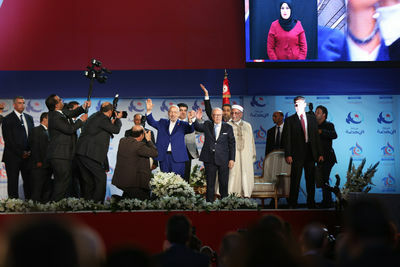 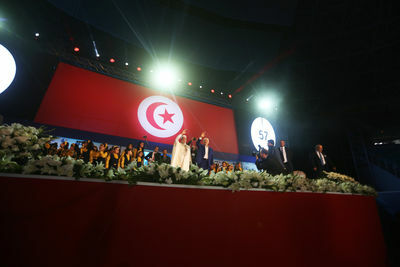 From the left to the right: Rached Ghanouch, president and leader of the Ennahdha, Abd Elfattah Moumou,vice-president of the party (behind), and Tunisian president Beji Caied Essebsi salute the crowd during the political movement's 10th congress that was held in Rades on May 20th, 2016. 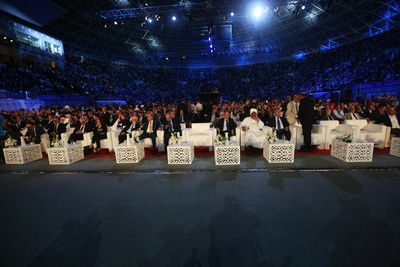 Guests of honor during the opening session of Ennahdha's 10th congress that was held in Rades on May 20th, 2016. 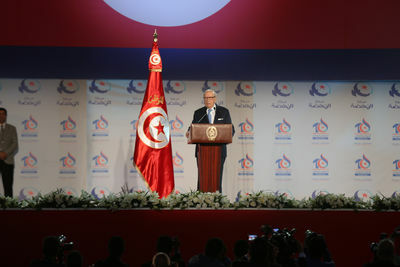 Abd Elfattah Moumou,vice-president of the Ennahdha party and deputy speaker of the Tunisian parliament, delivers his speech during the party's 10th congress that was held in Rades on May 20th, 2016. 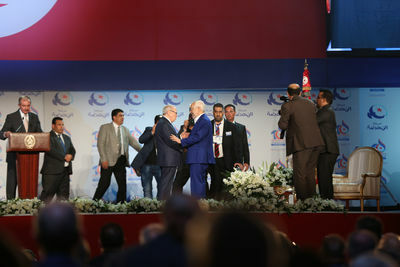 From left to right: Tunisian president Beji Caied Essebsi salutes Rached Ghanouch, president and leader of the Ennahdha party during its 10th congress that was held in Rades on May 20th, 2016.